Attorney Marshall “Tripp” Raucci joined Lynch & Pine in 2019 as the lead attorney in the firm’s the Personal Injury Practice Group. He has dedicated his legal career to representing the victims of medical malpractice and clients injured in car accidents, worksite incidents, and other life-altering events. Prior to joining Lynch & Pine, Attorney Raucci practiced law for six years at a top-ranked law firm in Providence, Rhode Island that specialized in catastrophic injury and medical malpractice cases. Attorney Raucci is an experienced trial attorney who has a passion for victim’s advocacy and fighting for the rights of injured parties and their families. 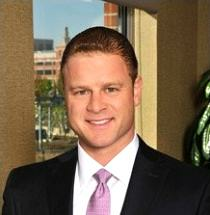 He has litigated numerous injury cases through trial and to verdicts. Prior to practicing law, Attorney Raucci was appointed to a prestigious judicial clerkship with the Rhode Island Supreme Court Law Clerk Department from 2007-2008. As a law clerk, Mr. Raucci was responsible for drafting judicial decisions on a wide variety of civil cases. Attorney Raucci is admitted to practice in the state courts of Rhode Island, Massachusetts, and Connecticut, as well as the Federal District Court and the Court of Appeals for the State of Rhode Island. Attorney Raucci is a member of the Rhode Island Association for Justice and has presented a CLE to Rhode Island attorneys on using discovery strategically in civil cases. From 2014 to 2018, Attorney Raucci has been selected by Super Lawyers as a Rising Star in the field of personal injury and medical malpractice.